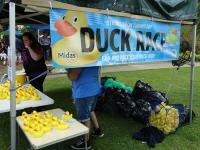 Sunday 26 June will see the return of the ever-popular Staines-upon-Thames Day. Held in Memorial Gardens, the Market Square and the High Street, there will be an abundance of events and activities for all ages to enjoy. From 11am until 5pm, the day will be filled with live music on the main stage; demonstrations, routines and live acts in the performance arena; boat rides, donkey rides and fairground rides; vintage car display, dragon boat and duck racing; kayaking and canoeing taster sessions; craft and community stalls; as well as a variety of food and refreshments on offer. Sponsored by local businesses and supported by Spelthorne Council, Staines-upon-Day is a great day out, showcasing some of the best talent the Borough has to offer. Info: Visit www.stainesuponthamesday.co.uk to find out what’s on throughout the day. Kick It Radio, Surrey’s Truly Local, Community Radio Station will be once again BROADCASTING LIVE with great music and lots of Competitions throughout the day! Since 1973, Shepperton Village Fair has been a major annual family event attracting thousands of visitors and this year’s event is being held on Saturday 11 June. Held close to the Thames on Manor Park, the Fair kicks off with a large procession through the High Street, followed by spectacular arena displays, fairground rides, stalls, competitions and the famous Great Nauticalia Raft Race. The procession begins at 11.15am near Shepperton Rail Station and the theme this year is ‘colourful carnival’. It’s the year of the Rio Games, so let’s get in the mood. The Fair opens at 12noon and the Raft Race starts near Nauticalia at 1pm. 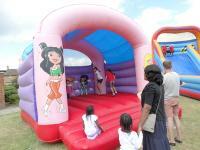 The Fair is organised by Shepperton volunteers and supported by local charities, organisations and businesses.